2018 was certainly an exciting year for industrial robotics and automation, with the explosion of industry 4.0, IoT (internet of things) and IIoT (industrial internet of things) – technological concepts that were to revolutionise manufacturing as we know it; the acceleration in the adoption of collaborative robotics (cobots) and the subsequent development of HRC (human-robot collaboration) robotics, designed to work alongside humans and the realisation of the smart factory. Characterized by adaptability, efficiency and ergonomics; systems that go beyond just the factory floor. In a nutshell, manufacturing trends have changed, and continue to evolve. Lean manufacturing principles are being adopted more and more to ensure that manufacturers are best placed to maintain the supply versus demand balance, react to changing market trends and attend to their customer’s specific needs and to remain competitive. If we consider the IoT, IIoT and industry 4.0, enterprises have to completely understand their product cycle and create flexible manufacturing processes, in real time. The evolution of smart manufacturing over the last 12 months has been significant. Smart factory concepts encompass big data processing, industrial connectivity and advanced robotics; gathering and understanding large amounts of information and/or data for analysis, to support a shift from reactionary to predictive practices. But to what end can this practice be beneficial? The simple answer is, to us all. Any business that operates a supply chain has to embrace the smart factory as a means to survive. This doesn’t just apply to high end, luxury goods, but to normal industrial products. A manufacturing system should be adaptable, designed with the smart factory in mind that can be reconfigured and repurposed to change quickly to changing product cycles. Smart factory, IoT, IIoT, industry 4.0, they all lend themselves to the same principle. 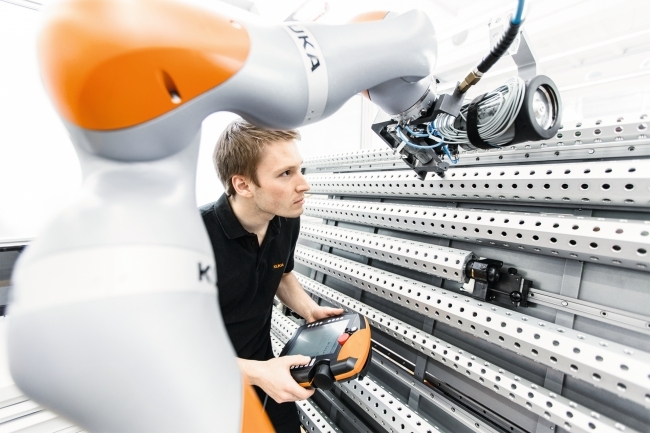 A truly connected manufacturing environment; connecting customer demands to production. Companies must now re-iterate their products quickly. They cannot afford to be tied into rigid production processes, making huge quantities of products of varying iterations. What if consumer tastes or design intent changes mid-run? Advanced robotics, or smart machines, can communicate directly with manufacturing systems and operate autonomously. The development of both AI (artificial intelligence) and sensory input (through means such as sight and touch) means that robots can now distinguish between different product configurations and make decisions independent of humans (all down to the might of the algorithm we might add, we are not quite at the stage where robots operate of their own free will). 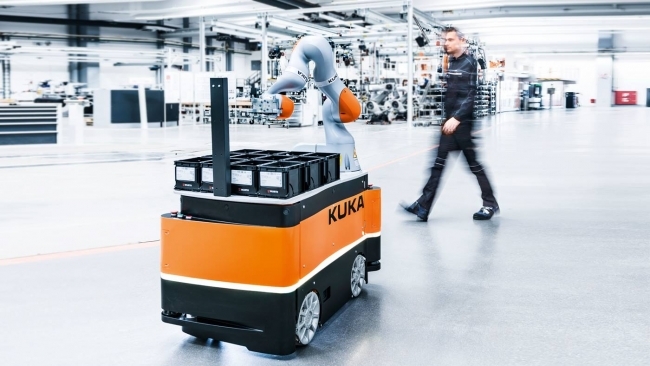 The optimization of robots to undertake tasks beyond their original, continuous sphere forms a key part of the fourth industrial revolution (industry 4.0) Mobile robotics (consider the KUKA KMR/KMR iiwa, or the KUKA omnimove) machine learning (autonomous learning through data input) reconfigurable robot cells and collaborative robotics. Ultra-efficient smarty factories will comprise one or more of these elements as a means to support agile manufacturing and provide a versatile and dynamic service offering to their clientele. And not everyone will, or did get it correct first time. Getting to a point where you have achieved a seamless automated supply chain takes time and investment. An essential part of smart factory technology is the ability to design and test products according to your specific operational requirements. But, realistically we are not able to halt a production line for testing purposes. So we create an offline replica of the application we shall be implementing. Otherwise known as a digital twin. Factory simulations allow engineers to get technically complex solutions correct first time without having to create a prototype or incur costly operational downtime (a similar scenario that might exist when training personnel within a clean room environment. Rather than halting operations/activity, the personnel are trained in virtual reality and the training put into practice in real time). There exist a number of software solutions in today’s market that provide the means to simulate a factory concept, enabling manufacturers to predict outcomes more accurately, and manufacture better products. Many companies who have not yet bought into industry 4.0 or the smart factory concept still struggle to define just what they should be doing to deliver real value. The digital manufacturing arena is a complex one that can leave some enterprises confused and unsure, though, with the right guidance and support, digital solutions can help them realize significant returns, both operationally and strategically. There is, after all, more to applying new technology than just buying the latest equipment. Implementing that technology in the right places and for the right reasons is essential and the existence of smart factory technologies help to solve real problems. But first, understanding how we embrace that technology is essential.